As I stood at the Air Berlin counter at the JFK airport, the German flight attendant smiled at me and said, “Just put your cabin baggage on the scale and then you are good to go.” A long series of expletives sounded off in my head: never before had I been asked by an airline to weigh my carry-on. I also knew there was no way that my bag was the impossibly light 17 pounds (8 kilograms) Air Berlin required. I have weak arms and consequently, to my utter embarrassment, I had to exert an abnormal amount of effort to lift my bag onto the scale. I heard the German woman tsk at me and announce that I was over the allotted weight and I would have to get rid of some items. Silently cursing the German cultural propensity for following rules and regulations, I unzipped my bag. Inside were more than a dozen books – books I had lovingly and carefully bought to keep me company during my 6-month stint in Germany. I stood there speechless and motionless, deciding whether to scrap my book on the governance in Singapore, student protests in Malaysia, political history of Taiwan, or education in Brunei, etc. After seeing its valuable content, the woman slowly re-zipped my bag and handed me my ticket. Beaming with joy, I marched off to TSA in triumph, silently praising now the Germans and their appreciation for education. Unfortunately, I did not learn any lesson from the story above. During a recent trip to Washington DC and then to Boston, I found myself in the possession of 10 extra books, due to my habit of frequenting used book stores. Although I was not formally reprimanded by US Airways for my carry-on weights, my sore arms reprimanded me for days afterward. 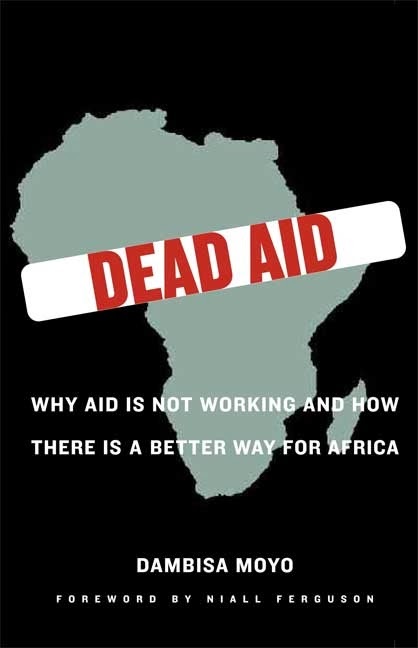 I say all of this only to mention that one of the books I bought was Dead Aid: Why Aid Is Not Working and How There Is a Better Way for Africa. I read this book before I had even started the African continent in my book blog. I got it because I suspected that it would complement the development economics section of my bookshelf, which was definitely lacking in material. However, as I have since been writing reviews on books on Africa, I continue to find myself referring back to this book and its interesting perspectives on western aid on the continent. For this reason, I feel like it definitely deserves a place on my book blog. Dead Aid is a controversial book – the full title alone shows that this book has a very provocative thesis, especially in the western world, where so many problems – whether they be personal or governmental – are “solved” by throwing money at them. It was a popular book and became a New York Times bestseller. The premise of the book has been criticized by many, most notably Bill Gates during a live conference. The interesting part about this book (to me, that is) is that it is a work of non-fiction written by an African. The author, Dambisa Moyo, was born in Zambia but holds degrees from American University, Harvard University, and Oxford University- the latter where she gained her PhD in economics. After having read so many non-fiction books by westerners in Africa, it was a nice change to read a well-researched, insightful non-fiction book by a native African. I hope that her example will serve as an inspiration – whether as an encouragement or as a challenge – to other Africans to join in the academic discourse that the West is currently having about the future of the continent. Moyo discusses the history of the aid industry, which began in earnest following World War II as the United States provided assistance to European countries via the Marshall Plan to rebuild the countries’ infrastructures. However, by the 1970s, the aid industry began to change its focus: “the World Bank very publicly reoriented its strategies towards this more pronounced poverty focus. Donor countries followed suit… In practical terms this meant redirecting aid away from large infrastructure investment (power, transport, etc. ), and towards projects in agriculture and rural development, social services (including housing, education and health), mass inoculation programmes, adult literacy campaigns, as well as food for the malnourished.” (page 16) I found this contrast very interesting, especially having after studied in Europe, where the Marshall Plan was viewed as an integral part of stabilizing the region and allowing it opportunities to grow.